Crude oil prices were left relatively unchanged with a bearish bias after the American Petroleum Institute reported its weekly statement. The API reported a large surprise build in crude oil inventories of 7.29 million barrels for the week ending March 1, coming in way over analyst expectations that predicted that crude oil inventories would build by 388000 barrels. Additionally, a stronger greenback also kept the pressure on the black gold. Investors will now shift their focus towards the US Energy Information Administration report on crude oil inventories which is due to be released later today. 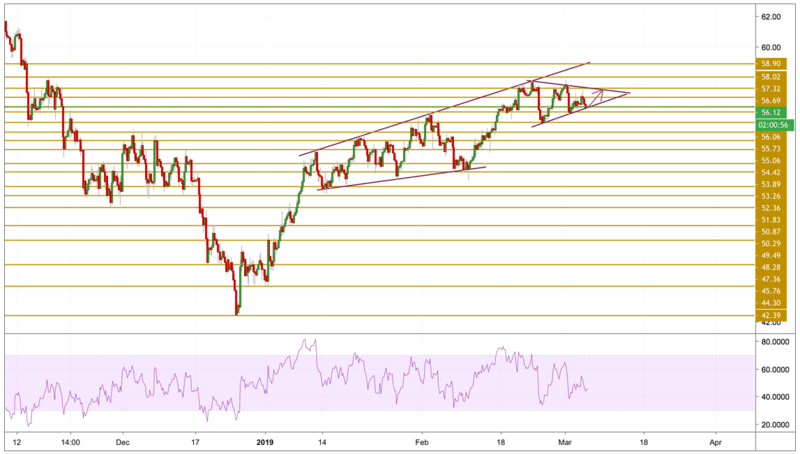 Crude oil prices moved higher towards the upper band of the symmetrical triangle but quickly reversed as bulls could not keep them above the $56.7 resistance level. The price is currently hovering just above the lower band with a relatively stronger momentum. If bulls could keep the price inside the pattern, a break to the upside will most probably occur. That is why we will be focusing on the upper band and particularly on the $57.32 resistance level.